The Ruins are on the a cliff just feet from the beach. Its an absolutely beautiful place, the water is clear and blue and the sand is so white. Getting to the archaeological site is easy on ADO bus or a taxi collective. Taxi collective from Playa Del Carmen costs only 40 pesos -3 US- (bus is 38) which is very cheap and much more affordable than a tour which costs 150 US dollars. When you get off the bus there are a ton of people who try to get you to buy extra tours which is a tourist trap so be careful. Other wise the entrance fee is 60 pesos -4.5 US- to get see the awesome ruins and beautiful beaches. The beaches of Puerto Morelos. Soft, white sand hugs my feet as I walk towards the ocean in Puerto Morelos. The surf is so calm, a sparkling blue hue as far as the eye can see. Children on spring break are laughing and splashing in the clear shallow water as adults relax and watch from beach chairs on the sand. The cool, clear water water laps around my feet as I walk further from the dry sand. The water is amazing. It is cold and refreshing and well worth the sunny, three kilometer walk from the bus stop. Occasionally, quick boats pass by carrying happy tourists, excited to snorkel and dive, out to the nearby reef. There are shallow places to snorkel near the shore too, providing a beautiful home to colorful coral and fish and turtles. 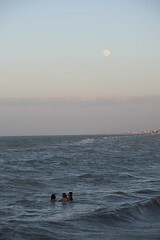 The peaceful little port town is just a thirty minute bus ride from the crazy and crowded Cancun beaches. Not many tourists come to the area as large hotels are limited. However, good food is abundant. 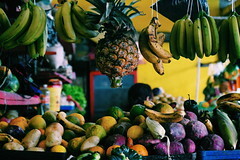 Beachside restaurants offer drinks and snacks, or for a cheaper alternative vendors walk down the beach carrying boxes on their heads of delicious fresh fruits, coconuts, and sweet tr eats. At the end of the day a natural color show of blues, and yellows, and pinks light up the sky. A bittersweet goodbye to a beautiful day in an even more beautiful place. 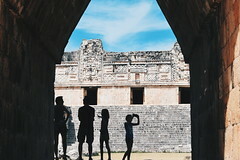 Chichén Itzá is one of the most visited places on the Yucatan peninsula, around a million people a year, and is one of the new seven wonders of the world. Prior to Spanish conquest, the city was the major urban center and hub of trade of the Mayan empire from A.D. 750 to 1200. 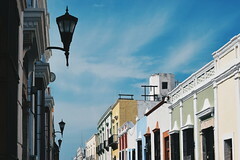 It was a very diverse city, which can be seen by the varied artwork on site. However, it is not known why the city was abandoned in the 1400’s. Historians think it may have been because of drought, over farming, or Spanish quests for treasure. Seeing this place in real life was an amazing experience. The history and artwork are very interesting as well. The site was a little touristy and busy, but it is definitely a wonder to behold. This is the stepped pyramid known as El Castillo. It has 91 steps on each side adding to 365. Not only did the Mayans invent the calendar but they were so talented at astrology that they could predict solar eclipses. Cenotes (sinkholes) in the city where the primary source of water. They were also used for sacrificing young girls to the gods. The Mayans believed that sacrificing to the gods was necessary to the life of the empire. 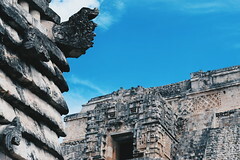 The Yucatan is known for not only its amazing beaches, but also its rich Mayan culture and history that is evident not only in people but in its numerous Mayan ruins. The Ruins of Dzibilchaltún were built thousands of years ago and are located about thirty minutes outside of the Yucatan’s capital city, Merida. It is thought that the ancient builders were trying to get as close to the ocean as possible, where salt production was taking place, without building in infertile land. There is a cenote here as well, where thousands of years ago people would go to get fresh water , but today visitors can swim in it. (Above) The Cenote was amazing to visit. The water was crystal clear and very deep in parts. The water lilies were beautiful. If you stay still long enough the small freshwater fish will nibble on you feet which is very cool. 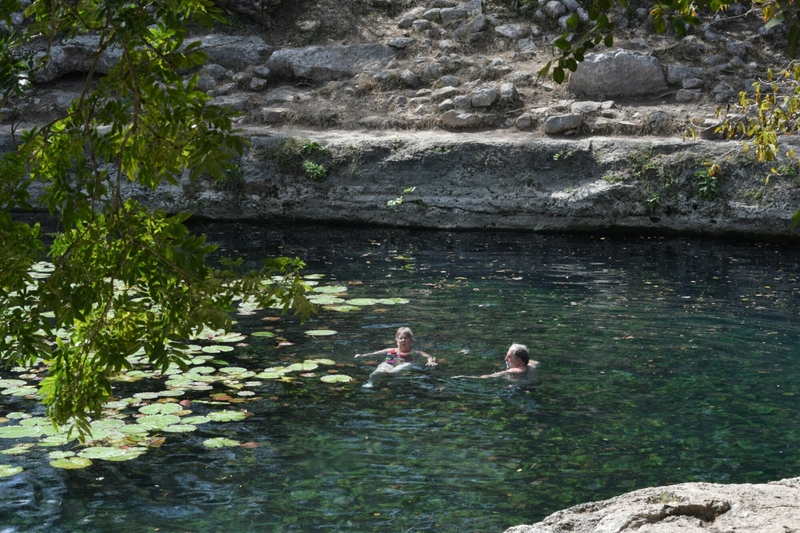 After a couple hours in the sun looking at ruins the cenote is the best way to cool off! The Mayan civilization was conquered by the Spanish conquistadores starting in the 16th century. 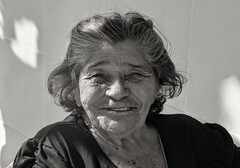 During this time the Mayan people were forced to become Catholic and many of their cities were destroyed. Of the ones that remain to this day, the ruins of Dzibilchaltún are very interesting. The main ruin is called the House of the Seven Dolls. It is named this because when it was being discovered archaeologists found seven small sculptures of people. In the middle of the ruins there is a ruin of a Catholic church which was built by the Spanish destroying some of the Mayan temples and buildings and using the stone to build their church.